Well...the Easter Bunny is in full "prep" mode and sometimes a bunny needs a little help. I was happy to find the "eggcellent" digital download from Stampin' Up! just waiting for me. 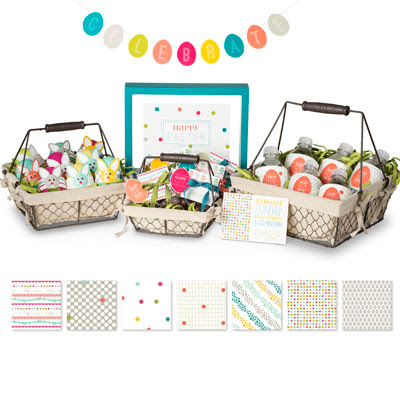 I love decorating the house and our table with fun, spring treats and design and MDS makes it SO easy. You just download...print...and VOILA! Love it! Jeepers...Creepers! I made Bloomin' Peepsters!! If you've read my blog for a spring season or two you know by now that I'm a HUGE fan of all things Peeps. Bunny Peeps, Chicks Peeps, Heart Peeps, Gingerbread Man Peeps, Pumpkin Peeps... You name it....I love them! A few years ago I stumbled upon a whole new level of awesome in the Peeps Empire called "Peepsters". Oh....My....Smurf! They are are heaven wrapped in a lovely, pastel foil wrapper. YUMMM!! Now...I was innocently minding my own business yesterday....strolling the aisles at Wal Mart and POW! There they were! I will tell you that having candy in my studio is never a good idea. I sit there sketching designs and I can hear it all the way across the room calling my name. But...how could I possibly leave those poor Peepsters there in Wal Mart without a good home? I like to call them "Bloomin' Peepsters"
They are so quick to make. The petals are made from the Blossom Punch (#125603). I used two for for each flower. 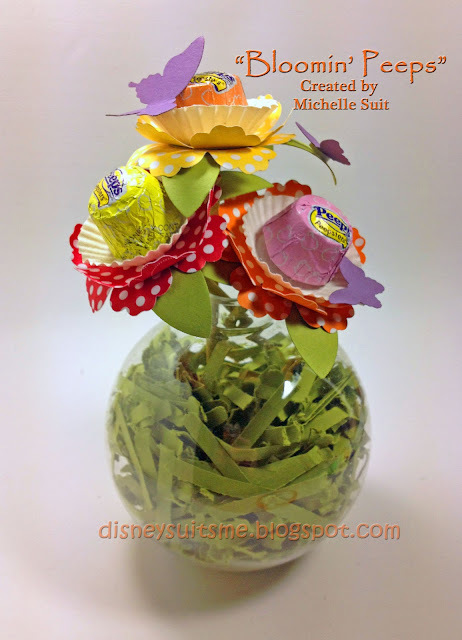 Then I used three of the smallest paper wrappers from the Pop Up Posies Kit from the Spring Catalog. I cut three wooden dowels to length, sponged them all with Lucky Limeade ink to match the leaves and adhered them together using Tombow adhesive glue. The top end of the dowel was cut at an angle...leaving it with a point that was inserted into the bottom of the Peepsters. How about the "vase". Can you guess what it is? I looked all over my house for a small bud vase but came up empty. One thing I did find was one of those clear, plastic Christmas ornaments you see in the big box stores around the holidays. I took off the top and filled it with shredded Lucky Limeade card stock that I ran through my shredder. Isn't that fun?? Okay....Fess up....What are YOU making in your craft room to get ready for Easter and/or Spring? I'd love to hear all about your project and I love it even more if you send photos. You never know....you might just have your project featured here on my blog. Happy Tuesday! 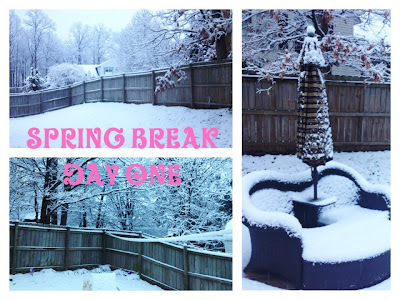 Happy 2nd day of Spring Break! Great news from here....the snow has melted. Now if it warms up we'll be all set for some real, fun adventures. I'll be in full "Julie McCoy-Cruise Director" mode and making the "magic" happen. this card just might do the trick. How sweet is that "ears to you" stamp?? I love the new single stamps. It's one of those that makes for a quick and easy....down and dirty card. No fuss...no muss. The best part is the price...$6.95! Woot! You can see all the other single stamps by Clicking Here. Hurry though. March 31st some of them will be going away for good. same stamp on the bag topper. Love it! Okay...I'm off to the Ledo Deck check movie times for "The Croods". Ummm......NOT what I was looking for, Puxatawney Phil! Oh well....the best news is that we still have a whole week off for lots of family fun, adventures and stamping! Woot! So...have you heard about the "Smash Book" phenomenon? I've seen lots of fun ideas for them on Pinterest and I've really wanted to make one (or MORE!) It's another one of those..."So many Smash Book ideas...so little time!" for me. Well, Stampin' Up! just announced an amazing, new product line called "This and That" and guess what......It's all about SMASH BOOKS!!! 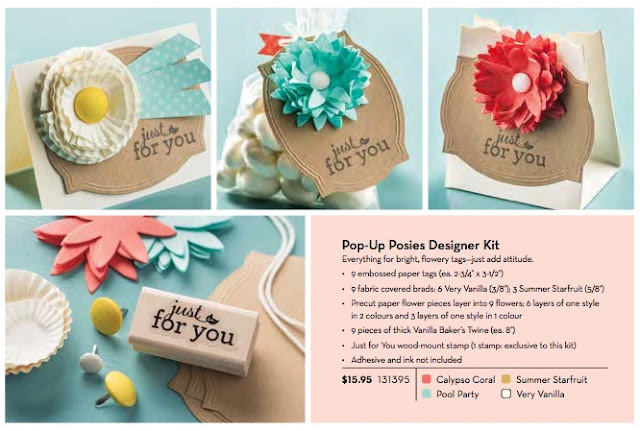 The "This and That" product line offers lots of fun goodies to create your very own Smash Book. I have SO many ideas of Smash Books I'd like to make. The first one will be "A Day In My Life" theme....then I'll also have one for the last four months leading up to Brittany and Sam's wedding! How fun is THAT?? I can't wait to get started! If you need ideas and inspirations for themes etc. just head over and check out my "Simply Smashing" Board on Pinterest. For more info you can head over to my Suitably Stamped Online Shop. No need to shower, get dressed or do your makeup! You won't have to scrape the snow off of the car either! We're off to find adventure! Wishing you a magical day! I'm just bustin' my buttons this morning! I was awake very early and I couldn't wait any longer! I had to get up and at 'em and share my latest punch art creation with YOU! Snow White! I can't begin to tell you the pressure I've had here from Lindsay!! She LOVES Snow White and has been campaigning with gusto to get me to get this punch art creation completed. I'm SO glad she did because I really am happy with how it turned out. Now...Here's some more exciting news. There are two different ways you can get the color tutorial for this beauty. You can purchase the tutorial by clicking the Paypal link below. When you go to my Online Stampin' Up! Store and purchase the Owl Builder Punch (one of my most used punches!!) you will receive the tutorial for FREE as a gift from me. 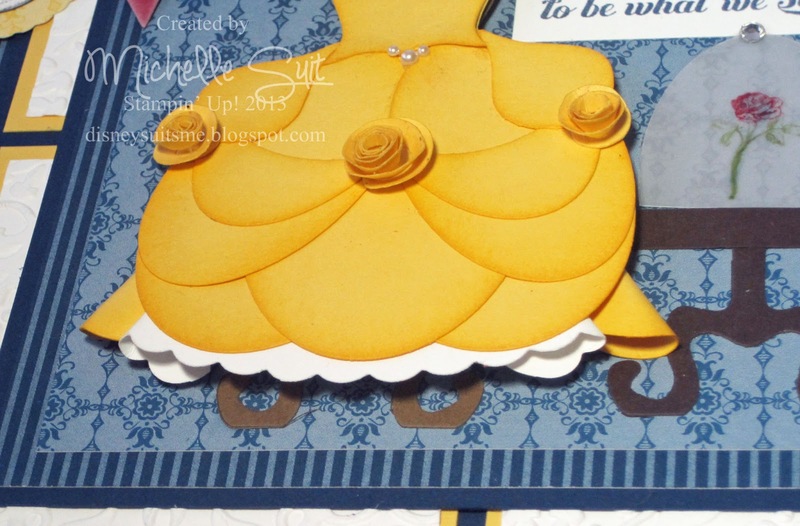 I think these princess dresses are perfect for cards and/or wall art. The possibilities are endless!! 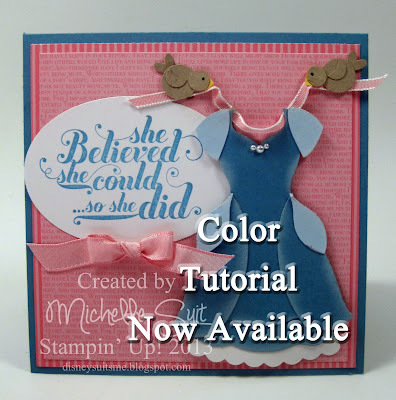 If you'd like to purchase the tutorials for Cinderella and/or Belle, just click on the "TUTORIALS" tab at the top of the page...right under the header of the blog. Is your card box getting empty? Do you need new "All Occasion" cards? Well, do I have GREAT news for you! Come and create 10 beautiful cards with coordinating envelopes and you'll be ready for all sorts of occasions. Be sure to share this invitation with your friends. I'm looking forward to stamping with you! Who doesn't love a party? I know I do! biggest party of the year. will say "Goodbye". So...we're gonna party like there's no tomorrow. Just go to my Online Store and place your order and for every $50 you spend you can choose one of the FREE Sale A Bration products. You will receive a FREE CLASS Coupon from me. What if you don't live near me?? Well...You will receive a FREE Stamp Pad of your choice. That's right! It's a BIG TIME PARTY!! Here's one of my absolute favorite sets and I'm really going to be sad to see it go. This one's called "Feeling Sentimental"
This card was created using the "Spotlight" technique. Ok...RUN...don't walk...(ok, you have to "click") over to my Online Shop and join in on this HUGE Party! You'll be glad you did. I can't wait to give out some FREEBIES!! I'm ready to PARTAY!! Are you?? 1. You can purchase the tutorial by clicking the PayPal link below for only $7.95 and the pdf files will be emailed directly to your inbox. from my Online Store by JUST CLICKING HERE. 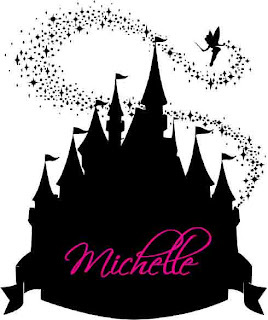 I am having a blast creating these lovely princess dresses and I can't tell you how overwhelmed I have been by all your wonderful emails and comments. It just makes me want to create a little more "magic" for you! 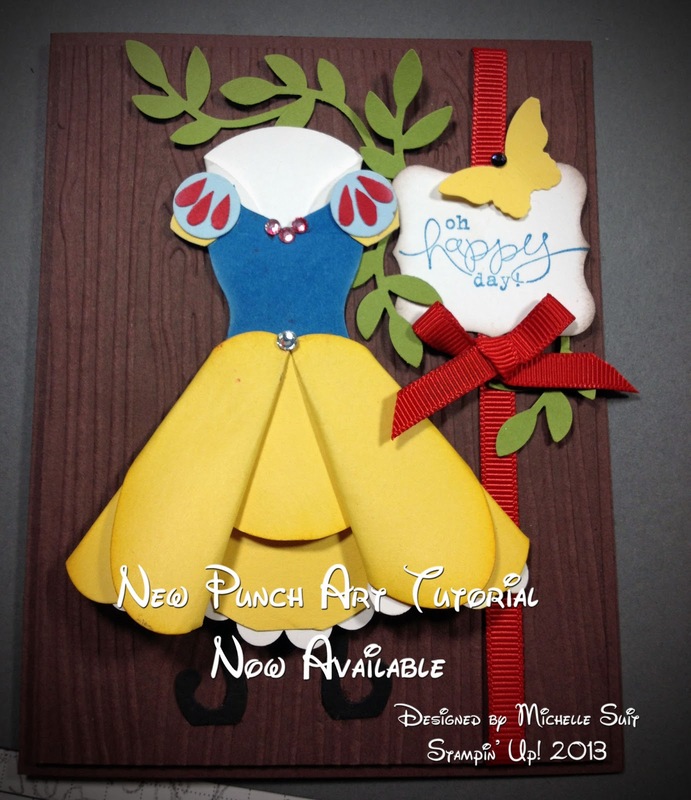 Please keep stopping by to see what's new and exciting with my Suitably Punched line of projects. Also...keep sending in those requests! Ok...I've had today's punch art idea floating around in my head for about a week now and it feels SO good to finally get it "done". If you've seen my recent projects, you've probably noticed that my body might be in Virginia but my heart is in Orlando. :-) More specifically....Disney World. 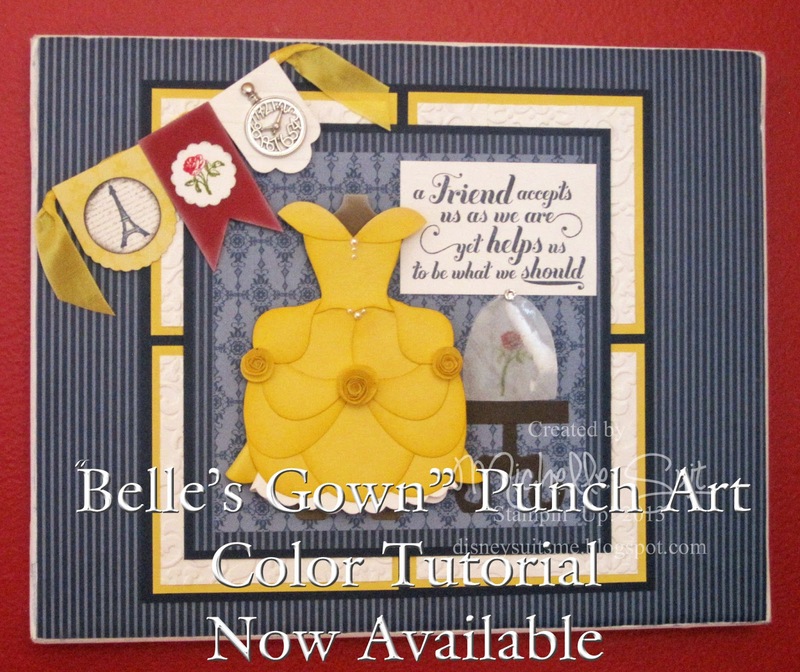 I decided to use the punch art creation I made as the focal point for a scrapbook page. 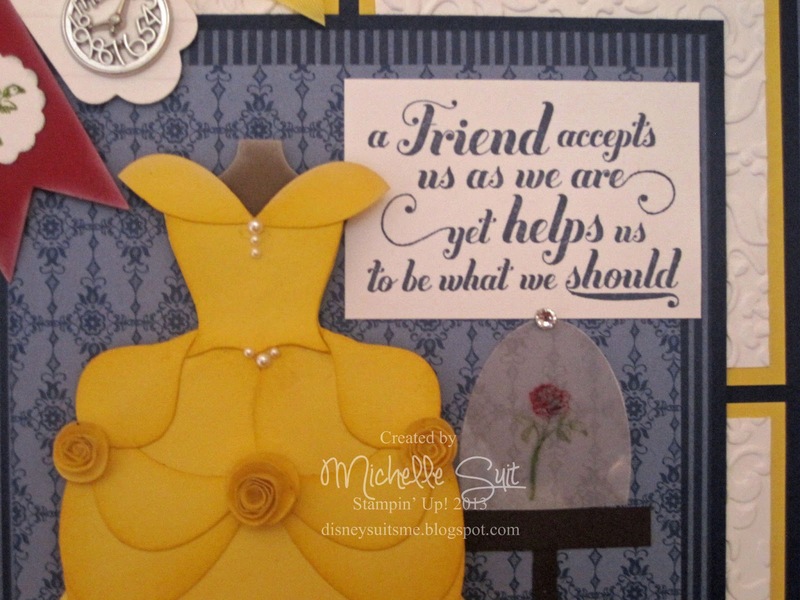 It fit in perfectly with the stamped sentiment I wanted to use and it's definitely the right theme. I have some adorable photos from Lindsay's graduation photo session and I haven't gotten them into a scrapbook yet. So....this was the first step towards that goal. All right....enough chatting....let's get to the punch art!! 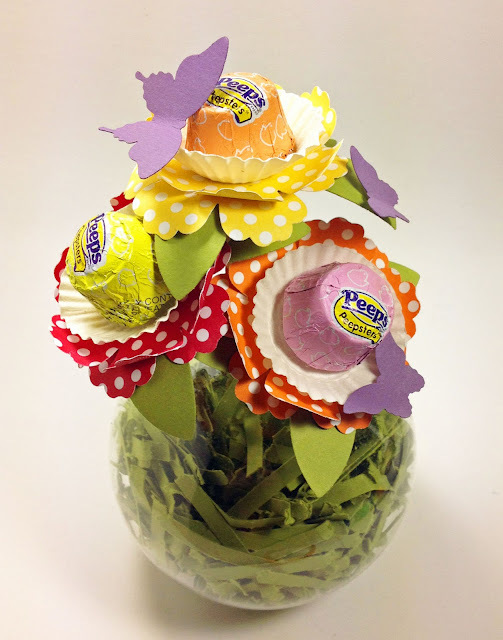 I also used the Ovals Framelits to make the sweet "swags" at the top. They remind me of the fabric on Cinderella's dress. Ok....It is really late here and I have SO much more to tell you. *sigh*. I will post again today with new class dates/times etc. and lots more so be sure to stop back by for a visit. 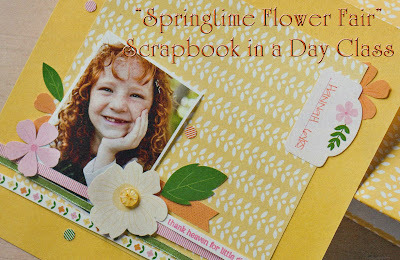 Come on over and "spring" into Spring with me by creating a beautiful 8" x 8" scrapbook. You will be ready to start this season off on the right foot with 20 pages just waiting for your fun photos. 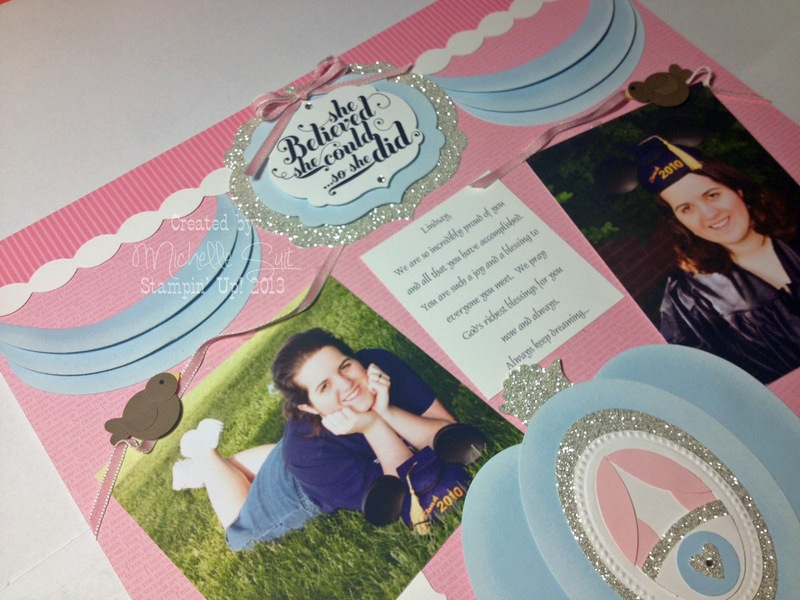 You'll go home with your finished scrapbook that's sure to be a cherished keepsake for years to come. Since this is a prepaid class, refunds will NOT be available. If you are unable to attend, your kit will be available for pick up beginning on Monday, April 8th. To register (pay for your class fee) simply click the "Buy Now" link for secure payments. 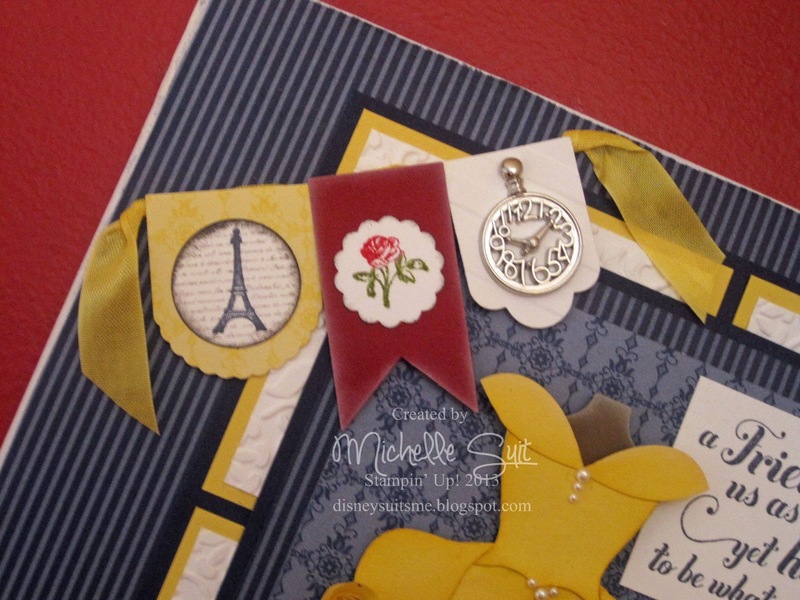 Class size will be limited to 12 stampers so don't wait....Sign up to reserve your spot. As always, please email me with any questions or leave a comment here on the blog. I can't wait to stamp with you soon! 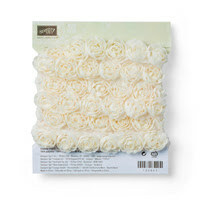 I love the flower trim that's in the Spring Catalog - it's so vintage and absolutely elegant. The skirt was made with the 5/8" flower trim. 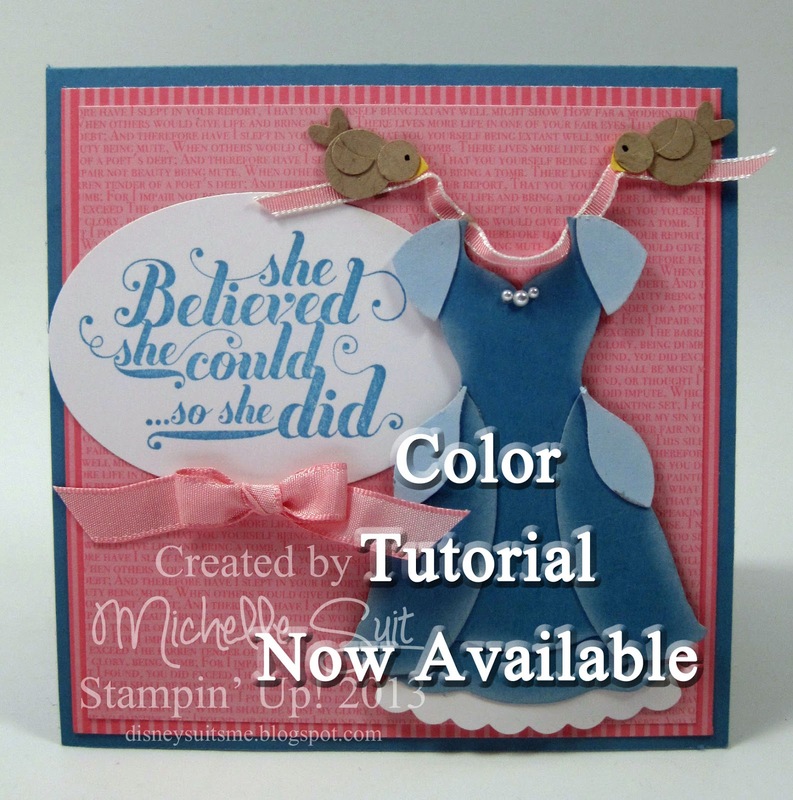 It comes in a yummy vanilla color and is easy to transform into any color of the rainbow. Now on to today's project... 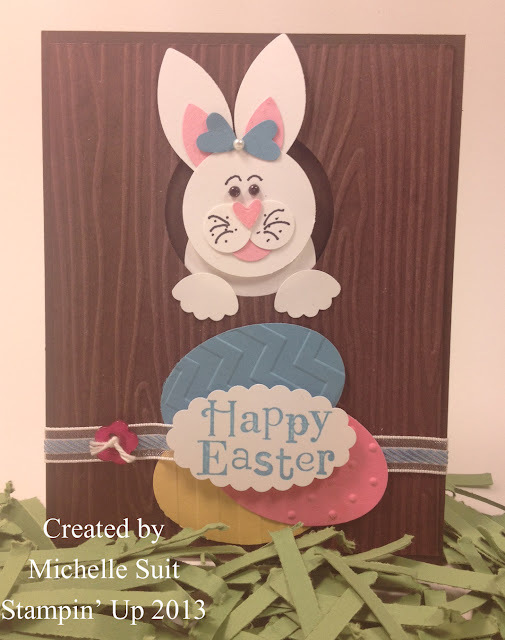 Here's a fun project with a new punch art critter that I created for a recent Easter card swap. Meet Delilah! 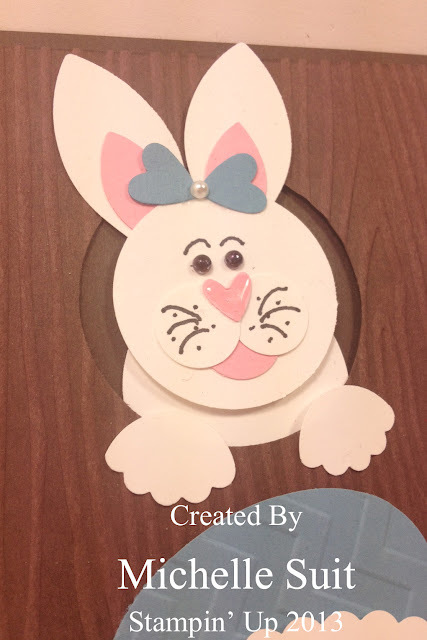 Delilah is peeking through the rabbit hole, checking to make sure that her Easter eggs are safe and sound... the Easter Eggs were created using the XL Oval Punch and then each one was embossed with a different embossing folder. I don't know about you, but Delilah and I are ready for Spring! Speaking of Spring, don't forget that items in the Spring Catalog are available now for you to start creating your Spring and Easter projects. 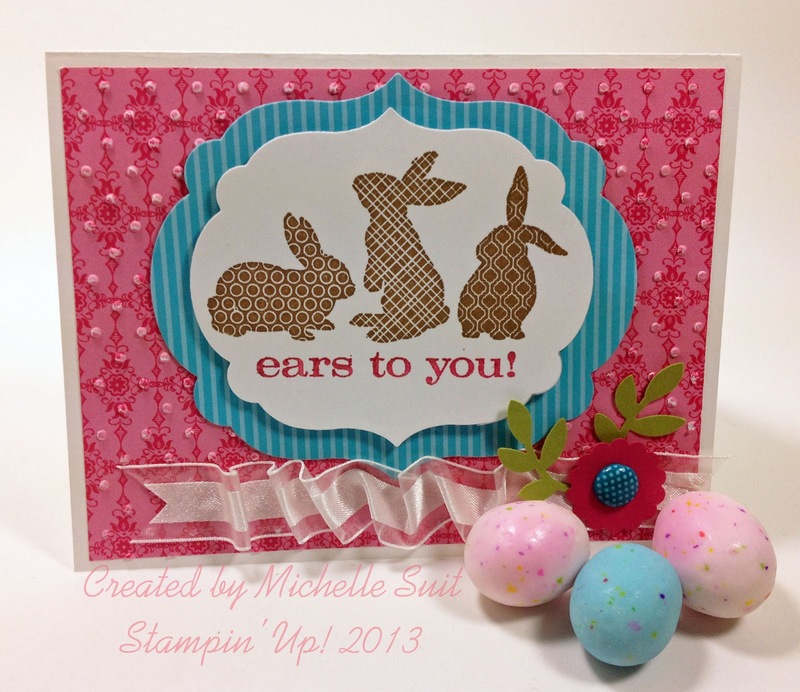 Hop on over to my Online Shop to see all the fun stamps and accessories that are now available. 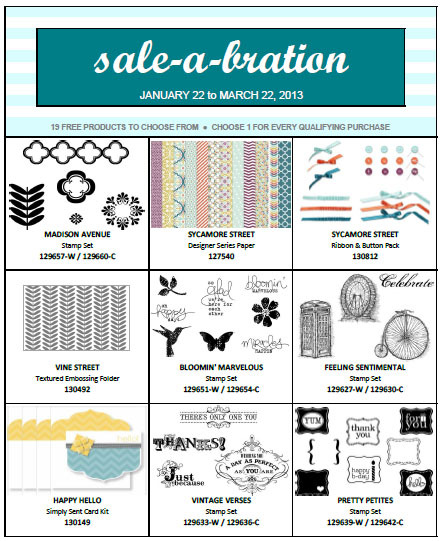 Also, Sale A Bration is winding down....It will end on March 22nd. Don't forget that you can get one FREE ITEM from the SAB catalog with every $50 you purchase. Want to get an extra 20% Off ALL of your stampin' supplies? Just ask me how! Happy Snow Day! It's a blustery, cold and snowy day here today and I LOVE it! No school and NO work. Wahoo! I spent the morning in the studio working on a new punch art project to share with you. I hope you're ready for a little more "magic". After creating Cinderella's dress last week my mind was just racing with new punch art ideas. I sat and sketched out a few but this one was definitely at the top of my "To Do" list. This is Belle's gown...on a canvas! I am SO please with the way it turned out. I added a little more dimension to the bottom of her dress by popping up folded pieces of the underskirt. I will be posting a new Suitably Punched Tutorial very soon with the instructions on how to make Belle's gown. I'm really excited about that!! I hope you are too. Please check back soon for all the details. For now...I'm off to get things ready for a yummy dinner for tonight. I hope that wherever you are that you are warm and toasty and I hope you have a magical day. Buy it separately... 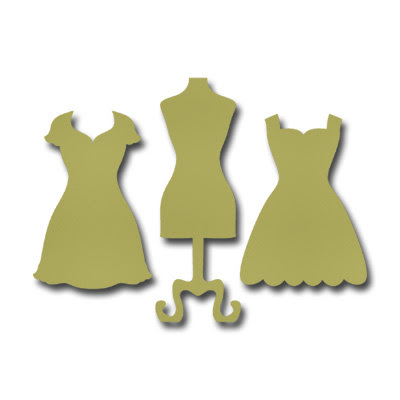 If you already own the Dress Up Framelits and would still love to make this fun project, you can order the color PDF tutorial for just $6.95. Just click on the PayPal button in the right side bar here on my blog to "Buy" yours now. Thanks SO much for the overwhelming response to this project. You all have just touched me more than you can imagine and I thank you from the bottom of my heart. Have any other questions? Don't hesitate to email me. I'd be happy to chat with you! 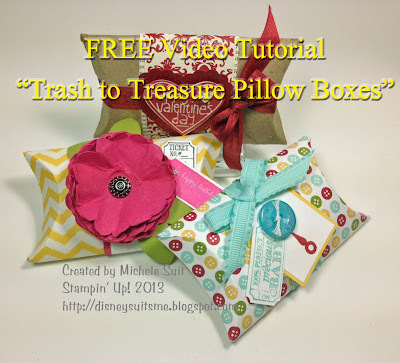 "Trash to Treasure Pillow Boxes". It's definitely a project you can make at the spur of the moment. Check it out... Just CLICK HERE. I hope you have a blast making some of your very own. I'd love to see what you come up with.